Kunal Sen and Tisha Deb Pillai are the heart and soul of Good Bad Habits, an animation studio based in Vancouver, Canada. How far has your motion design career taken you? 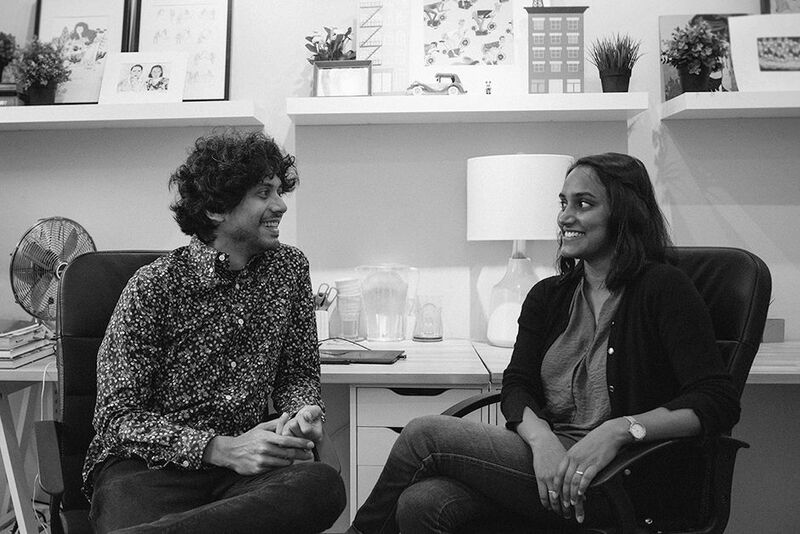 For many motion designers, moving to a new city can be an important step in your career, but few motion designers have traveled as far as Kunal Sen and Tisha Deb Pillai on their motion design journey. Good Bad Habits fun mograph style can be seen in all of the work they produce. Here's their latest demo reel. I sat down with Good Bad Habits to talk about the journey of their careers, why they love telling real human stories, and how Good Bad Habits came to be. Can you tell me about yourselves? Where did you grow up? Where does this passion for visual storytelling come from? Tisha: I spent my childhood years in New Delhi. At home, I was exposed to the world of art, music, literature, and films from a very young age. This inevitably cultivated a passion for storytelling within me. I used to spend hours with my father drawing, building clay sculptures, fashioning crafts for holiday assignments; my hands always itched to make or fix something around the house! Every week, I would watch my mother on television reporting stories on rural India (on topics like health, education, women, unemployment) and after the show was finished, she would ask me to critique them. At first, I used to just critique what my mother was wearing or how she was standing! But gradually I got the hang of it, and began thinking more about storytelling, editing, and filmmaking. Since my mother is a documentary filmmaker and my father is an artist, I like to think I chose a profession that meets them both halfway! Kunal: I grew up in Calcutta, which is a super artsy, old, cultural city in India. My parents were extremely open minded and supportive of whatever my brother and I wanted to do as young kids. They opened our eyes to the outside world at a very young age, so we grew up with a daily barrage of music, films and art. I think my passion for visual storytelling started from seeing my mother paint, as well as looking at LP covers and album art of music I was drawn to. The world wasn’t as “open” in the early 90’s pre-internet / globalization, so a single image would stick with you for years and evoke magical fantastical narratives in your mind! Where and how did you learn animation? Kunal: It was a long winding journey for me to stumble upon animation. My entire childhood, the only thing I wanted to be was a Graphic Designer and design logos and album covers. After high school I went to a super young and experimental design school in India called Srishti, but after my foundation year there I felt like I was stagnating. I knew this was not a good sign given that I had 4 more years to go there as a student. It was at this time that I was drawn to animation, which seemed to be at the intersection of several practices - art, design, film, sound, music, acting, illustration etc… Srishti didn’t have an animation program, so I taught myself animation over the next 4 years. However, I soon felt like a “one-trick-pony” as I had no peers to learn or get critiques from, and all my experiments would start taking very predictable directions... I figured that if I wanted to do animation seriously, I would have to study it properly - to be amongst talented people, to learn from them, to see more work. I decided to do a 2nd undergrad at Emily Carr University in Canada. Why ECU? First and foremost because it was affordable, and it offered a storytelling and directorial based animation program which was exactly what I was looking for. That being said, we’re a community of lifelong learners in this field, so we’re always students! Tisha: I studied Product and Interaction Design at my first undergrad at the Srishti School of Art+Design in Bangalore, India. I played around with electronics and coding, and found ways to channel my passion for storytelling while creating speculative tangible objects. I dabbled in visual communication and illustration, but it wasn’t until I met Kunal that I seriously looked at Animation as a profession to pursue. I would spend hours watching him animate, and it became increasingly hard to escape the captivating nature of this medium! I saw beautiful walk-cycles emerge out of thin air, and fascinating characters come alive to tell pertinent stories. The joke in the family is that he forced me to do animation after marriage, but the truth is once I made up my mind, there was no looking back! A year later, I was at the Emily Carr University in Vancouver to study animation! I met professors who were extremely resourceful and engaging, and gradually I became a part of an animation community that inspired and encouraged me to keep pushing my boundaries! How did your partnership come to be? How did you come up with your company name: "Good Bad Habits?" Tisha: Kunal and I worked on several small projects together, and soon came to realize we shared a very similar vision and work ethic. When I completed my studies at Emily Carr, we decided to join hands and start our own studio. Kunal had been working in the animation industry in Vancouver for almost 10 years and had a basic business model already set up. Kunal: Choosing a name was the hardest part! The name Good Bad Habits was initially inspired from a set of Indian traditional charts about how an “Ideal Boy” should behave and what is considered a “Good Habit”. I had made a little personal project called “Good Bad Habits” inspired from these kitsch charts, and somehow the name really resonated with us. Our definition for the idiom is as follows: “a favorable behavior pattern acquired by frequent repetition or physiologic exposure that shows itself in unwelcome regularity”. An example of a ‘Good Bad Habit’ would be our unhealthy obsession with animation! How do you work as a team? How does the work break down? Does one person start with a design or do you come up with ideas together? Has the "couple" teamwork approach ever proved challenging? Tisha: Working with your partner isn’t as hard as it’s sometimes painted out to be! Especially given I’m always right… In terms of our process, we usually take the lead on separate projects and consult each other when required. If we are both working on the same project, we break down the workflow according to our strengths. For example, one person handles all the character design and animation, while another handles the background design and animation, effects and compositing. Team-work can be challenging when there is a difference in opinion, so whoever has more leverage at that point in the relationship, wins! Nah.. we just keep discussing it till we reach a middle ground. Most of the animation films showcased in your portfolio have to do with telling real stories, whether autobiographical or a piece within a documentary. What is it about "real" stories that you love? In what way can animation enhance the story of a documentary film? Tisha: Yes, we both LOVE telling human stories. That’s just our thing! Living between Canada and India, we’ve had a chance to imbibe and engage with a vast array of people, cultures and ideas - and there are just so many powerful stories waiting to be told! As viewers and filmmakers, we are most drawn to realistic, dramatic and emotional narratives. A lot of documentary filmmakers approach us with scripts that have a lot of “talking heads”, and want to replace them instead with compelling animations to illustrate the same anecdote. Sometimes animation is also used to depict stories from the past that cannot be shot in live-action, or portray people that cannot appear in front of the camera due to the delicate nature of the content. How do you find/connect with your clients and/or collaborators? Kunal: We try and reach out to people outside the medium of animation and motion graphics as much as possible! We try and connect with Directors and Producers in the Film industry, as well with people in related fields like Advertising, Art, Design and Technology. We’re super interested in these areas, so we look for work in these spaces. Often clients write to us saying they saw something we previously worked on, which is probably the best way to find a gig! Word-of-mouth is also how we connect with clients. We’re extremely lucky to be in Vancouver which has a vibrant animation and motion industry, and we’ve had the good fortune of being referred projects from fellow professionals and studios. Likewise, we’re often pointing projects to other animation peeps whenever we’re unable to take on a project! Another thing we’ve tried to keep doing over the years is to create small personal projects where we experiments with ideas or techniques. A lot of clients have approached us based on things we’ve made this way, so it’s something we hope to keep doing more of! Why have you chosen Vancouver as home base? From your point of view, how is the animation/motion graphics community scene in B.C.? In India? Kunal: Vancouver has completely transformed since I first got here in 2006 in terms of the animation and motion scene. For every area in the media spectrum like 2D and 3D animation, motion design, visual effects, gaming, advertising, etc, there are large to medium to small studios all the way down to individual freelance artists in the entire city. Vancouver is also a great place to study animation, so a lot of talent enters the city this way and then stays back. Weather wise, it’s warmer than most northern North American cities in winter (even New Delhi seems colder!) and it is beyond beautiful in summer... The “elevator pitch” for Vancouver would be a city that's wedged in between mountains, a forest and an ocean! On a personal level, It’s quite hard for both of us to be so far away from home (India is exactly on the other side of the world), but we Skype with our families every other day. We’re going to have a child this December, so a brand new Indo-Canadian family unit is going to start soon! In the case of India and animation, we try and differentiate between individual animators and the larger animation industry. India has a LOT of extremely talented jaw-drop-worthy animators, but the animation industry as a commercial entity exists in very specific spaces - mostly in Advertising and Special Effects. As a result of this, most of the really cool work that’s being made in India exists on individual Vimeo or Instagram artist profiles, but that level of talent is not necessarily reflected in a lot of the work that one sees commercially. Hopefully that will change over the next few years! What are your influences? What inspires both of your styles? Tisha: Growing up in India, I feel I’ve been influenced a lot by the colors and designs around me - in textiles and spices, on the streets during festivals, and in people’s homes. A lot of my influences have also come while searching outside this familiar world to find a completely polar aesthetic in the western culture. With every new project, I like the idea of consciously playing with these contrasting sense of styles - be it extravagant vs. minimalist, kaleidoscopic vs. monochromatic, abstract vs. representational and so on. Kunal: I find this question really hard to answer as influences keep changing over time, and one’s biggest influences are usually ones that you had when you were younger (and naive!). So the honest answer would be Pink Floyd, Michel Gondry, MC Escher and Les Triplettes de Belleville, but cringing just listing these out! Did they affect me more than the cooler, hip things I’m into now? Probably yes! That being said I’m the most inspired by music and history. We both approach animation from a design point of view - where form and function have to go hand in hand. Like most generalists, we’re good at a lot of things but not exceptional in any one field in particular. I’m excited by the idea that our best work is yet to be made! Tisha: I think we try and approach all our projects in a similar way - where we identify a core problem/need and then try and figure out an interesting and playful way to solve it. Being a small studio we feel like everything we do has to be good and at a certain standard quality-wise. The challenge can sometimes be how to reach that standard if the budget (which affects the number of days we work on it) is not sufficient. Any advice for young people wanting to get a start in animation/motion graphics? Kunal: Hmmm… Our advice to people who are starting out would be to have an ongoing dialogue with yourself about your strengths and goals in this medium as you move forward. Motion design is an extremely vibrant and ever-evolving medium, and it helps to be able to take a step back from the micro stuff and observe the way things are moving at the macro level before making choices to go one way or another (for example, the choice to work in a studio or to freelance). We really think that having fun with what you do and making the kind of work you like to see is the main thing. Work hard, and everything else will figure itself out! Oh, and label and color code your layers! Do you have any specific goals for the future? Tisha: We’d love to keep doing what we’re doing now and be able to move back and forth between Canada and India with our work! We are also in the process of developing a feature film idea, but that takes time and is whole different ball game - but hopefully ONE day! Kunal: I think we’ve got a good thing going in terms of our work vs life balance, so our future goal would be to go deeper down this rabbit hole and get even more interesting and challenging gigs. We’d also love to collaborate with more freelance animators and illustrators! You can learn more about Good Bad Habits on their website. You can also find their work on Instagram, Vimeo, Facebook, & Behance. If you like their work be sure to hit them up!